Job seekers with a criminal history often wonder whether they have to disclose that information when applying for a job. On many job applications, there is an option to check a box indicating whether or not you have a criminal record or conviction. If you check yes, you are asked to explain your circumstances. There is a good chance that if you check yes, a prospective employer will deny you employment even before they read the rest of your application. However, it’s never a good idea to lie on your job application or during the interview process. Remember that while an employer can choose not to hire you based on your record, you can also be fired for not disclosing it. You are much better off being truthful. If you have impressed the employer with your qualifications and experience, your criminal record may not be a hindrance to being offered the job. Be prepared to share any changes that you have made to overcome any limitations that led to your crime. Know your rights and what questions hiring managers can ask you during the application process, so that you’ll be able to mitigate the impact that a criminal record might have on your job search. Because of the potential for discrimination, many states, cities, and localities have laws known as “Ban-the-Box” legislation. This legislation limits what an employer can ask candidates on a job application or during the early stages of the screening process. Laws and policies require or recommend that employers consider how all candidates meet the qualifications for jobs prior to considering criminal record information. This does not mean that employers can’t go ahead and check your criminal history or consider its impact on potential performance when conducting a background checkor later in the hiring process. According to the National Employment Law Project, over 150 counties and cities, 34 states, and the District of Columbia have adopted laws or policies that impact what employers can ask job candidates about their criminal history on job applications, prior to evaluating their qualifications. Twelve states — California, Connecticut, Hawaii, Illinois, Massachusetts, Minnesota, New Jersey, New Mexico, Oregon, Rhode Island, Vermont, and Washington — have also mandated the removal of conviction history questions from job applications for private employers. The laws are intended to protect jobseekers with a criminal record from being eliminated from consideration prior to receiving a fair chance to meet with and impress employers. However, employers in these jurisdictions can still conduct background checks after they have issued a tentative offer. They can eliminate candidates from consideration on the basis of their findings. Contact your state office of the Department of Labor for information about the latest laws in your location. Currently, in states without legislation that prohibits asking questions about criminal records, most applicants must indicate whether they have been convicted of a crime in the past 10 years. Job applicants convicted of disorderly offenses in the past five years are subject to the same scrutiny. "A categorical denial of employment opportunities to all job applicants convicted of a prior felony paints with too broad a brush, and denies meaningful opportunities of employment to many who could benefit greatly from such employment," he said. The EEOC recommends that employers consider whether any criminal offenses will impact the candidate’s ability to perform the functions of the target job in a safe and effective manner prior to excluding applicants. 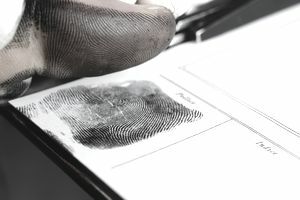 The Society for Human Resource Management (SHRM), the primary professional association for human resources practitioners, recommends that its members establish policies prohibiting the inclusion of criminal record information on job applications. SHRM says that the best time to conduct a background check is after a conditional offer is made based on how well a candidate’s qualifications match the specific job requirements. SHRM announced in 2019 that employers representing over 60% of employees have signed onto an initiative entitled “Getting Back to Work”, committing to changing their recruiting practices to include those applicants with criminal backgrounds. A 2019 survey of consumers by SHRM indicated that 78% of consumers were comfortable buying products from companies that hired individuals with a non-violent criminal record, for customer facing roles. The information contained in this article is not legal advice and is not a substitute for such advice. State and federal laws change frequently, and the information in this article may not reflect your own state’s laws nor the most recent changes to the law.